As exchanges continue to increase their requirements for surveillance of orders, Trading Technologies is adapting to the changing landscape and availing users with a methodology to change the Operator ID of working orders. 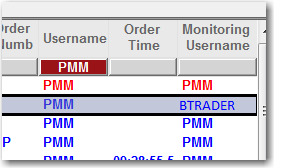 The new Update User button in X_TRADER 7.17 allows users who share an order book to inform the exchange that a new user is monitoring an order that may have been submitted by a different user. 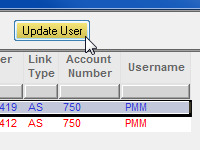 Operator ID, which may be referred to as Username or Tag 50 on CME products, may be changed in X_TRADER 7.17.x with the Update User button located on the Order Toolbar of the Order Book, Orders and Fills Window (OFW), and Parent Order Book. A single left click of the Update User button will change the Operator ID of a highlighted order to the Operator ID of the user who is logged into that instance of X_TRADER. Trader Pat (Username = PMM, Operator ID=PAT) places an order at 1 PM CST. Trader Pat leaves the office at 5 PM CST and Trader Bob (Username = BTRADER, Operator ID=BOB) logs into X_TRADER, either on the same workstation as Trader Pat or a new workstation. Depending on the exchange rules, the TT Gateway will either indicate the change in ownership of the working order immediately or wait for the next action to be performed (e.g., re-quote) before processing the change. If it allows the update and it’s acknowledged by the exchange, the TT Gateway updates the Monitoring Username field in X_TRADER and other client trading applications with the Username of the trader (monitoring user) claiming the order, and also changes the Operator ID on the order. The Operator ID is not displayed in X_TRADER; the universal login IDs (Usernames) of the traders involved are displayed. For orders submitted by an automated trading system (e.g., Synthetic SE), the Operator ID is changed for both the parent and child orders. For re-quotes or other subsequent order actions, these actions are sent to the exchange with the updated Operator ID. If the change request is rejected by the TT Gateway, the Operator ID value remains the same; that is, it’s the Operator ID of the user that originally submitted the order. Q: Is the functionality applicable for CME orders only? A: No, “Update User” works for all exchanges, however, it is only applicable to the exchanges that require end users to pass an individual trader identifier to the exchange. For more details about what value is sent to the exchange via the Operator ID field, refer to Operator ID Support. Q: What are the minimum software versions that support this new feature? A: TT Gateways 7.17, X_TRADER 7.17.1, and TT User Setup 7.4.12. Q: How do I configure the Operator IDs correctly? A: Please refer to the Editing a User’s Gateway Login Attributes and Operator ID Support topics in the Help Library.